…The words of the Universal Declaration are not yet matched by facts on the ground. In practice, people all over the world still endure constraints on – or even total denial – of their human rights. As this is the first time I have the opportunity to address a UN body after the Security Council resolution of last Saturday on Syria, allow me please to say a few words in that regard. As you know I welcome the Security Council’s adoption of a resolution demanding a cessation of hostilities throughout Syria for at least 30 days. But Security Council resolutions are only meaningful if they are effectively implemented. And that is why I expect the resolution to be immediately implemented and sustained, particularly to ensure the immediate, safe, unimpeded and sustained delivery of humanitarian aid and services, the evacuation of the critically sick and the wounded and the alleviation of the suffering of the Syrian people. As you know, the United Nations is ready to do its part. As I had the opportunity to say in the Security Council itself a few days ago, in particular eastern Ghouta cannot wait. It is high time to stop this hell on earth. And I remind all parties of their absolute obligation and international humanitarian and human rights law to protect civilians and civilian infrastructure at all times. And similarly, efforts to combat terrorism do not supersede these obligations. C’est un honneur pour moi d’être de nouveau parmi vous aujourd’hui et cette année, qui marque le 70e anniversaire de la Déclaration universelle des droits humains. Cela fait soixante-dix ans que ce puissant instrument contribue à transformer en profondeur le monde dans lequel nous vivons. La Déclaration universelle reconnaît l’égalité et la dignité de tous les êtres humains, et que tous les gouvernements ont le devoir de permettre à chacun d’exercer ses droits et libertés inaliénables. À ce propos, je tiens à dire clairement que, lorsque nous parlons de droits humains, nous nous référons à l’ensemble des droits civils, politiques, économiques, sociaux et culturels, dont le caractère universel a été reconnu dans la Déclaration. Où que nous vivions et quels que soient notre situation ou notre place dans la société, notre sexe ou notre orientation sexuelle, notre race, notre religion ou nos convictions, nous sommes tous égaux en droits et en dignité. La Déclaration universelle établit également que le respect des droits humains est la meilleure stratégie de prévention. C’est le mépris de ces droits qui a conduit aux actes de barbarie qui ont été commis durant la Seconde Guerre mondiale. Et dans le monde d’aujourd’hui, c’est aussi en assurant la primauté des droits humains que l’on peut prévenir les conflits. Toutes les situations de crise qu’examine actuellement le Conseil de sécurité s’accompagnent invariablement de violations des droits humains et d’atteintes à ces droits. Celles-ci vont de la violation des libertés individuelles et collectives aux transgressions flagrantes du droit international humanitaire et aux crimes contre l’humanité. Je félicite le Conseil des droits de l’homme d’avoir mis l’accent sur la prévention dans les dialogues informels qu’il a tenus à Glion en 2017. Et mon bureau est prêt à aider le Conseil à renforcer son rôle de prévention. C’est uniquement en respectant et en promouvant les droits humains que nous pourrons tenir notre objectif fixé dans le Programme 2030 : assurer l’avènement de sociétés diverses, inclusives, pacifiques et viables à long terme sur une planète saine. La diversité est une source de richesse pour toute société. Je connais personnellement l’importance des droits humains : j’ai grandi sous une dictature, et j’ai été témoin, en ma qualité de Haut-Commissaire pour les réfugiés, des terribles répercussions des violations des droits humains. Et je n’ignore pas qu’il nous reste, malheureusement, un très long chemin à parcourir. This is not to deny that we have made considerable progress in the past 70 years. And perpetrators of horrific human rights violations have been prosecuted by international tribunals. We are seeing a groundswell of xenophobia, racism and intolerance, including anti-Semitism and anti-Muslim hatred. Far right political parties and viewpoints are seeing a resurgence. Refugees and migrants are often denied their rights and unjustly and falsely vilified as threats to the societies they seek to join, despite the proven benefits they bring. Outdated, law-enforcement only approaches to drug control have fuelled violence and human rights abuses and failed to decrease illicit drug use and supply. And, in several cases, a heightened focus on counter-terrorism is eroding respect for fundamental rights. The media is increasingly under attack in all regions. And the space for civil society -- and human rights defenders, in particular -- is shrinking and becoming ever more dangerous. These are just general trends. There are also many specific examples of egregious abuses. The list is dispiritingly long, far too long for me to detail here. But let me single out the plight of the Rohingya Muslims in Myanmar. I have travelled several times to Northern Rakhine. In my experience, the Rohingya are one of the most discriminated against populations in the world – and that was even before the crisis of the past year. Deprived of nationality, they have been subjected to extreme brutality by military forces and others, and cast out of their homes and country in a clear example of ethnic cleansing. They are under siege as a group – simply for who they are. And this is why I took the initiative to write an official letter to the Security Council about this issue. And this is the first time since 1989 that a Secretary-General has taken such an action. The Rohingya community desperately needs immediate, life-saving assistance, long-term solutions and justice. The international community needs to come together to support the safe, voluntary, dignified and sustainable return of refugees to their areas of origin or choice, in accordance with international standards. The recent agreement between Bangladesh and Myanmar can only lead to that reality through massive investment – not just in reconstruction, but in reconciliation. And full implementation of the Rakhine Advisory Commission recommendations is also vital. To make human rights a reality for everyone, we need far more determined and coherent action. We must speak up for human rights in an impartial way without double standards. And we must invest in human rights and recognize them as values and goals unto themselves – and not allow human rights to be instrumentalized as a political tool. Member States have defined international human rights law and placed it at the heart of the United Nations. Yet there is still some resistance to support United Nations action on human rights. We must overcome the false dichotomy between human rights and national sovereignty. Human rights and national sovereignty go hand in hand. There is no contradiction. If we had given much greater attention to human rights globally over the past two decades millions of lives would have been saved. That is why I appeal to Member States in all United Nations organs to consider how to strengthen support for UN action on human rights. And it is why I am working – in the spirit of Human Rights Up Front -- to ensure that the United Nations places defending and promoting human rights at the core of all our efforts. An emphasis on human rights lies at the heart of conflict prevention, which must be our highest priority. And the Human Rights Council’s Universal Periodic Review is for that an essential tool. It subjects every State, with no exceptions, to the scrutiny needed for accountability. And it recognizes that all Member States can make improvements, and that UN system has responsibilities to support States in this regard. And yet, there is still a profound gap between our knowledge and action. This is why it is imperative for this Council –and the United Nations as a whole – to focus much more on implementation and national follow-up. 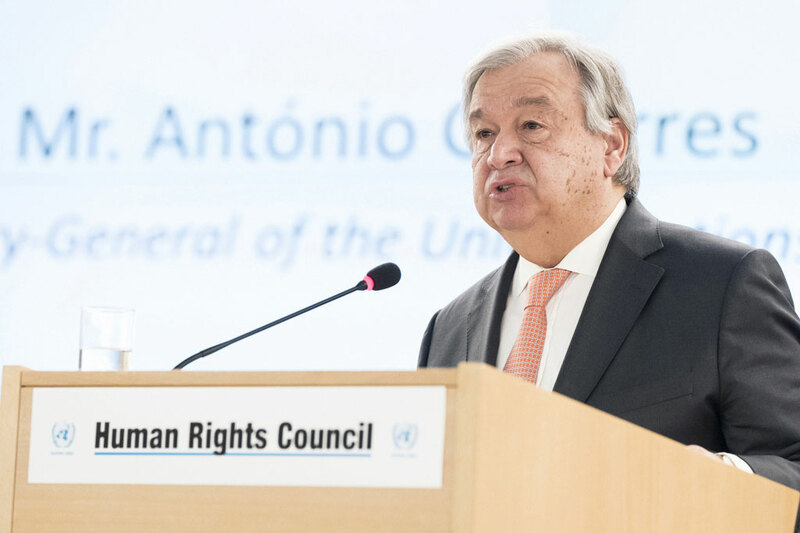 Human rights must be weaved into United Nations action at all levels – from analysis, to planning, to assessment and accountability for progress. The Universal Periodic Review and the Treaty Body processes provide a tremendous resource of standards and guidelines. And we must find streamlined ways to bring the outputs of these human rights mechanisms systematically into overall UN action and all our efforts to support the achievement of the Sustainable Development Goals. But, to uphold human rights and reverse the current backlash, we need to be better able to support Member States to implement the expert guidance coming from the human rights mechanisms. We do this by helping to draft laws and policies in line with agreed standards and building institutional capacity to help safeguard these standards. For example, we have assisted the offices of attorney generals to investigate and prepare for the adjudication of complex cases involving international crimes. We help to develop national human rights institutions by supporting the sharing of experiences between human rights bodies facing similar challenges. And we also support a vibrant civil society to promote inclusive, accountable and effective public institutions. And help victims of international crimes to claim their rights. Human rights are not a luxury; they are a collective responsibility that all Member States have signed on to. One key element in upholding human rights, promoting accountability and exposing abuses is our support for civil society. I deeply admire the courage and sacrifice of human rights defenders. These individuals and organizations are our eyes and ears and conscience. And we should all be deeply shocked and angered by the extent to which civil society actors suffer reprisals, intimidation and attack because of their work, including when they engage with the UN system and with this Council. I will report on the challenges facing human rights defenders to the next session of the General Assembly. For now, let me offer my personal condolences on the recent death of Ms. Asma Jahangir -- a true champion of human rights. As a Special Rapporteur of this Council, as a great citizen of Pakistan, and as a towering representative of the force of civil society, she devoted her life to the pursuit of the vision of the Universal Declaration of Human Rights. She also stood for the rights of women, reminding us again that women’s rights are human rights. She was a great example to us all. Finally, I would like to take this opportunity to commend the work of the High Commissioner and to thank him for his service to the United Nations and the cause of human rights. High Commissioner Zeid has shown tremendous courage in highlighting human rights concerns in all regions. And he has shown equal dedication in working with governments to resolve those concerns. The world counts on the High Commissioner, his office, and this Council to expose human rights violations wherever they occur and to press for change. Let us use this 70th anniversary year of the Universal Declaration of Human Rights to continue to advance this essential work.